From the outset, I must state that I have always abhorred résumés, references and bio's of all sorts. In fact, I told the President of "Old Vic" in 1954 that I hoped one day my name would serve as my sole reference. In 1962, one of my teaching colleagues asked me how I would respond to the question: "Who are you?" I recall that I gave a lengthy philosophical reply about being the product of my education and other experiences. My colleague's simplistic response was, "Most persons would simply state their name." How clever! Hmm-m-m. The word "clever" is an adjective I have generally reserved for animals that have been able to learn tricks. Please do not be insulted if I offer, as my initial response, a series of photographs which affirm my identity as much as anything else . . . with the caveat that (1) I volunteered in 1954 to participate in the development of a standardized undergraduate university intelligence test and (2) twice during the years since my post-graduate degree, I offered samples of fingernail clippings and hair for a study of DNA in an attempt to correlate the results with a genetic propensity for diseases and longevity. Naturally, I have no idea about the results of either study. Without further subjective analysis about the preceding soliloquy, here are some photographs (followed by my brief autobiography). 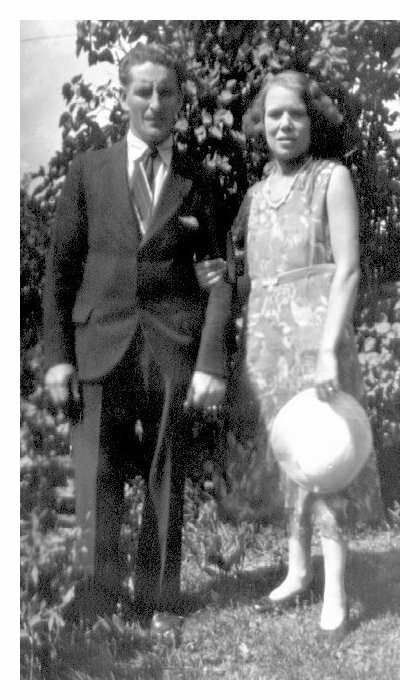 My parents, John Caven Alexander Ross and Beatrice Leona Badgley were married by my grandfather, Reverend John A. Ross, in his home at 923 Logan Avenue in Toronto, Ontario, on July 6, 1929. That was the same year as his retirement as an active United Church (formerly Presbyterian) Minister. My name, John Douglas Ross, I have been told many times, was given to me by my Aunt Phoebe Jean McGregor Ross. I was born at 7:00 AM in the home of my maternal grandparents at 79 Cromwell Avenue in Oshawa on Mothers' Day, May 11, 1930. I was delivered by Doctor Wilson, our family physician for many years, who weighed me in at eleven pounds. In the year of my Grandmother Badgley's death, she had three surviving daughters, 15 grandchildren and 27 great- grandchildren. No annual reunions were established, but I recall one family picnic in 1940 (and several sporadic family gettogethers). 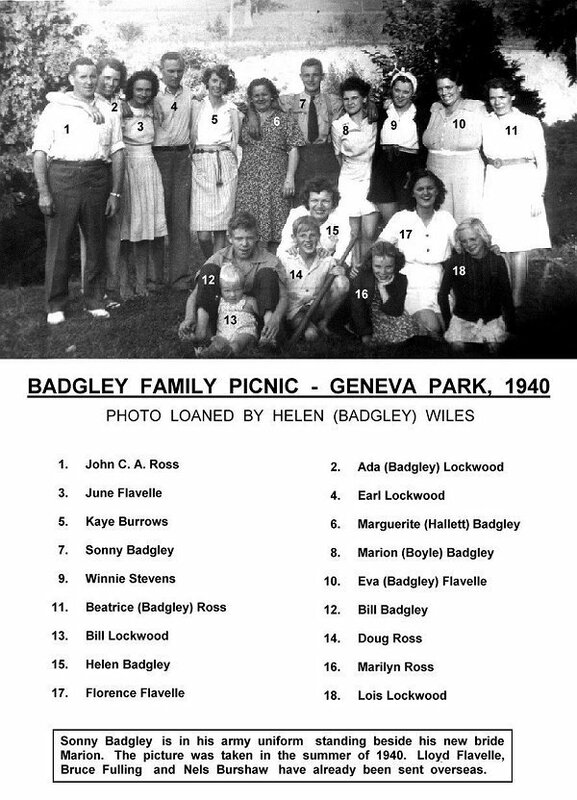 My Uncle Joseph Flavelle took a photograph of a Badgley picnic in 1940. 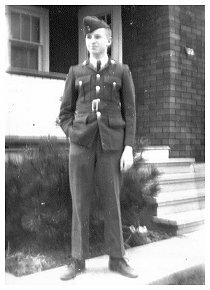 His niece, Florence Flavelle, had been sent over from England to escape the Battle of Britain in World War II, and my cousin Edward "Sonny" Badgley had just enlisted in the army. The picture shows our family, with my father and mother at each end of the back row and my sister Marilyn and I seated in front. Three aunts, an uncle and several of my first cousins are included here. 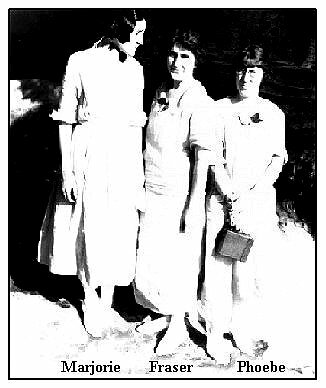 My three Ross aunts, sisters of my father, each played significant roles during my childhood. My Aunt Marj (1902-1985) gave me my first experience in a Kindergarten Class one afternoon in the spring of 1935 at the Model School on Pape Avenue in Toronto, where she taught a Grade 4 class. All of my primary education (Grades 1 to 3) took place in Centre Street School, Oshawa. My Grade 1 teacher was Aileen Found, who was one of the few elementary teachers with a B.A. degree. Carrie Stinson, my teacher in Grades 2 and 3, had to contend with a couple of my lengthy absences with rheumatic fever. One sunny afternoon in Grade 3 I was a tad late for school and, rather than face the principal (Aaron W. Jacklin), I played hookey with the sister of socialist Ed Broadbent who became the Federal leader of the New Democratic Party. My Aunt Fraser (1890-1965), a graduate of Johns Hopkins School of Nursing, probably saved my life when I was three years old by feeding me steady doses of strong tea to cure my intestinal poisoning after doctors had given up any hope; when I was about seven years old, she took me to see that magnificent Indian impersonator Grey Owl at Massey Hall, and she agreed to my request to see him backstage . . . not realizing that "backstage" was not really in back of the stage. This great conservationist died during the following Spring. My Aunt Phoebe (1898-1973) took me on my first airplane trip during the summer of 1945, and the pilot circled Niagara Falls during the flight from Toronto to Buffalo; we took a jet to New York City in the winter of 1952 and visited friends in Tarrytown, NY, the locale of "The Legend of Sleepy Hollow" by Washington Irving. Alas, this aunt also borrowed my hard-cover edition of Ray Bradbury's The Martian Chronicles and lost it on a Toronto streetcar. It would appear that I survived the removal of my perfectly healthy tonsils on my Ross grandparents' kitchen table at 38 Woodycrest Avenue in Toronto . . . after being bribed with the promise of a bowl of ice-cream when the operation had been completed. I wondered if the sacrifice of one's tonsils had something to do with the war effort. Almost everything else was being collected during those years . . . newspapers, aluminum foil, rendered fat, etc. Your First teachers are your family. In my formal education, the primary teachers were most important. It was a long walk from our rented home on Warren Avenue to Centre Street School (Aaron W. Jacklin, Principal). I learned to read and my primary teachers from 1936 to 1938 were Aileen Found in Grade 1 and Carrie Stinson (later Mrs. Valleau) in Grades 2 and 3. It was a crime to arrive late, so I played hookey one day in 1938 with Velma, sister of Ed Broadbent who became Federal leader of the New Democratic Party. As World War II began, our family moved to the Westmount community on the Western outskirts of Oshawa, where our house was built at 22 Alexander Boulevard. My elementary education continued at Westmount Public School in classes taught by Kenneth McKee (Grade 4, and leader of the Cub Scouts), Delbert Gainer (Grade 5), Mrs. Evelyn Barton (Grade 6), Harold Pascoe (Grade 7) and Amelia Lear (Principal and Grade 8). Judging from my stockings, I must have still been in the Cub Scouts when this photo was taken. My cousin Bill Badgley wanted me to accompany him to have a picture taken. 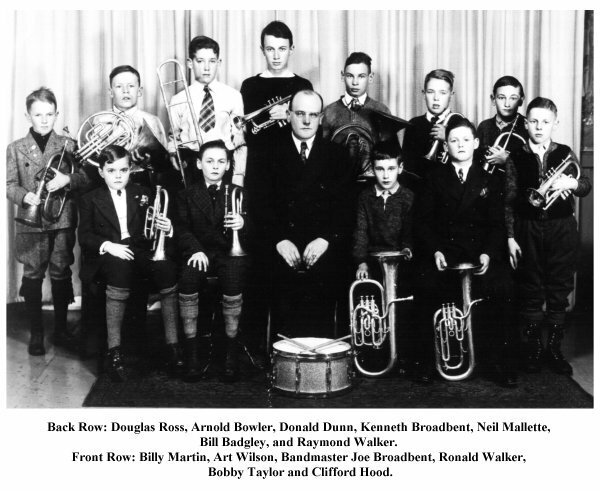 Joe Broadbent, "musical director of the Oshawa Regimental and Civic Band", undertook to train boys of the community as future brass bandsmen. I had to be shown how to hold the French Horn, and I cannot remember if I ever held one again. [I actually did take violin lessons with other teachers when an instructor of the Grade 6 students in the school volunteered to teach us the basics. Unfortunately, my fingers at that age were not sufficiently nimble to master the vibrato.] In the process, however, I learned enough about music so that, one day, I was comfortable making corrections to sheet music I received for The Earl of Ross's March. Oshawa Collegiate and Vocational Institute was a very unique secondary school. We were taught two technical subjects in each of three terms during the first year (Grade 9), and there was compulsory physical education for all five years. I took advantage of the fact that it was a true collegiate where languages were taught, and I was disappointed when I had to drop Latin in Grade XIII. Language study must have instilled in me a curiosity about Pictish/Ogham origins and translations in the lands of my ancestors. At the beginning of that year, students were encouraged to select subjects from three academic time-tables and construct their own. In spite of the load, I was the only student to pass all of my eleven subjects during the final year. 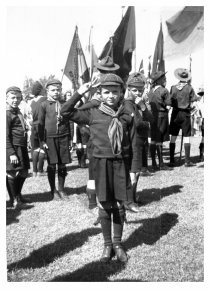 All male students in secondary schools were expected to become members of a cadet corps: army, sea or air. I chose to join the Oshawa Chadburn Air Cadet Squadron No. 151, and earned the opportunity to obtain a pilot's license with a Flying Scholarship during the summer of 1948. 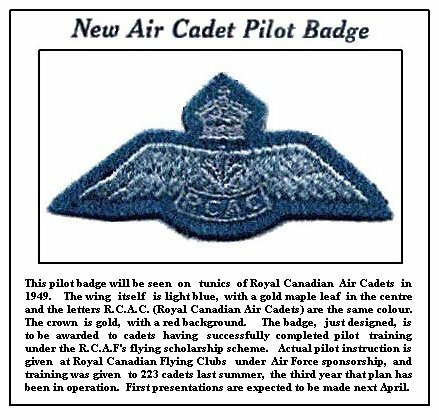 I was one of four cadets from the Chadburn Squadron, representing 10 per cent of the successful candidates across Canada that summer, to receive the new R.C.A.C pilot wings. [My friends pointed out that I had a pilot's license before I passed my driver's license.] Some of my subsequent adventures in flying a circuit have been posted at my website. Without betraying the identity here of a fellow cadet, I managed to receive important lessons in "street smarts", which taught me to differentiate between a friend and a leech. One of my hobbies during these years involved crystal sets. By tuning a coil to different radio frequencies and using a clothes-line for an antenna, I was able to pick up faint signals from nearby radio stations. The familiar Morse "YZ" (dah-dit-dah-dah dah-dahdit-dit) of Toronto's Malton Airport also came in quite clearly, but one day I used a home-made directional antenna and my earphones picked up a strange rapid Morse from the direction of the lakeshore south of our home. The mystery was solved about a dozen years after the war, and I could not resist writing a short account about "Camp X" on my website. There were other activities at OCVI, such as the camera club in which I was a member from 1946 until graduation in 1949. 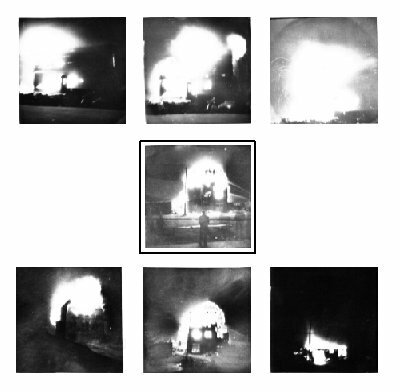 In May of 1947, I took photographs of a fire at the Irwin Auto Parts Building threatened scores of Oshawa and East Whitby homes. The photographer from the Oshawa Times Gazette newspaper accidentally sat on his equipment, and offered me $25 for my negatives, but I had already agreed to $15 from a representative of Canada's National Newspaper, The Globe and Mail. 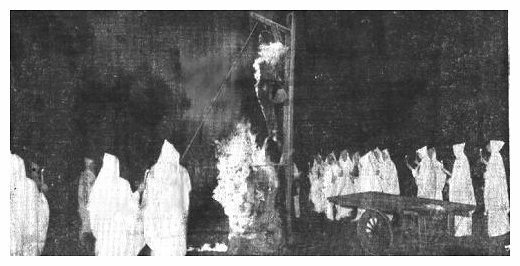 The picture, outlined to the right, was printed in The Globe on Saturday, May 10, 1947, on the day before Mother's Day . . . my birthday. During the summer of 1949, I worked for the Finley W. McLachlin Construction Company on the extension of the southwest runway at the Oshawa Airport in order that the field could handle emergency landings of Trans Canada Airlines. A drainage ditch had to be laid and, later, I was assigned to weigh trucks loaded with gravel. Part-time summer employment thereafter involved the General Motors on the efficiency line, in the night paintshop, or loading car bodies from the paint-ovens onto the assembly lines. During lay-offs, I also took temporary jobs at a Labatt's Brewery warehouse and as a salesman for the Grolier Encyclopoedias. 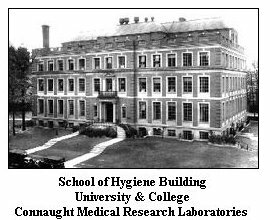 My first full-time employment was with the University Division of the Connaught Medical Research Laboratories in Toronto. I worked as an assistant to Doctor Milton H. Brown in a lab at the north-west corner of what was known as the School of Hygiene Building on the south-east corner of King's College Circle on the University of Toronto Campus. This wee lab was responsible for the production of anti-measles serum, cholera vaccine, typhoid paratyphoid alpha & beta with tetanus (TABT) vaccine, and antigen for tuberculosis testing. During the Manitoba floods in the spring of 1950, we delivered twenty 20-litre bottles of TABT to Winnipeg. I was encouraged to attend the courses for Officers in the Department of Public Health in the building, and was privileged to see the first side view of a spiralling perfect insulin crystal using one of the first electron microscopes in Canada. The experience was terrific, but the pay was minimal. I usually had a nickel and a streetcar ticket in my pocket by payday. When I tendered my resignation, two persons were hired . . . Doctor Plummer and another assistant. I had been offered a belated raise in salary, but had already made up my mind to attend the Toronto Normal School for teacher training. I graduated from Toronto Normal School in June of 1951. While there I played the part of the captain in Gilbert and Sullivan's H.M.S. Pinafore, but I was best remembered for the curved pipe I smoked (to keep my chin warm during the winter). Instead of entering the teaching profession immediately, I headed to Victoria University at the UofT from which I graduated with a B.A. degree in 1954. During this period I began writing science fiction; I submitted an excerpt from my Just Between Two Worlds to be read and critiqued by the illustrious Professor Northrop Frye at a meeting of the Writers' Club in the spring of 1954, and it was included in the final issue of Acta Victoriana that year. 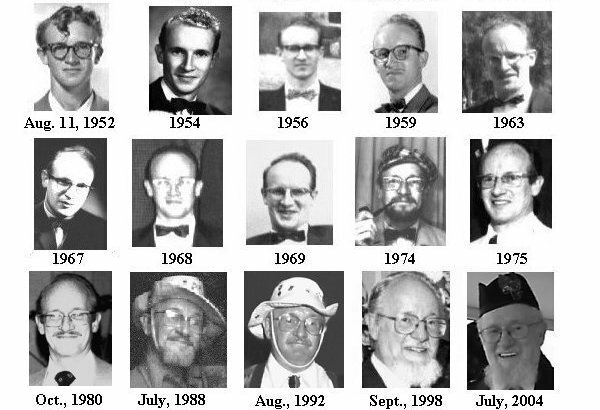 I consider myself fortunate during this era in the history of the UofT to be able to attend lectures by Professors Edmund S. Carpenter, H. Marshall McLuhan, and others, who were not always on my time-table. "McCarthyism", a recent introduction to our language, was a hot topic when we returned to studies in the Fall of 1953. Students from Middle House (and other Vic residences) joined in a peaceful demonstration on All Hallows' Eve, and we obtained more publicity than had been expected. Because we were Canadians, the "ringleaders" could not be brought before the senator's investigation committee! Besides, some of us were far too busy working on scenery and the stage crew at Hart House Theatre for the Victoria College "Bob Review" at the beginning of November. During 1953-1954 I was editor, publisher (using a Gestetner machine) and distributor of the weekly newsletter for Victoria University, the Vic Strands. Needless to say, things could get lively in the coffee shop after activities such as a Victoria College Union meeting were satirized. After graduation, I entered the teaching profession in the West end of what is now Metropolitan Toronto, and taught at C.E. Webster, Silverthorn (until the fire in 1957) and Keelesdale Public Schools. I served as vice-principal at Warren Park, Silverthorn, Fairbank Memorial and George Syme Public Schools, and was a principal (8 years) at Harwood and Lambton Park Junior Public Schools. I coached the township's championship hockey team during the winter of 1960-61. I was the instructor of a statistics course for elementary and secondary school teachers who were taking a Departmental Guidance Course on Saturdays during the winter of 1969-70. In 1969, I was the elected President of the Principals' Association for the area. Before my retirement in 1987, I had taught the full range of elementary grades (often double), English as a Second Language (ESL groups), Primary Music (Grades 1 to 3), and enrichment courses on computers (while also providing work experience for secondary school students taking computer courses). After courses at the Ontario College of Education during the summer of 1959 (Unit 101 Our European Heritage and Unit 102 Our North American Background), a Bachelor of Education Degree was conferred on May 25, 1960. Unit 212 Supervision and Unit 241 Educational Measurement and Evaluation I were completed during the summer of 1960. 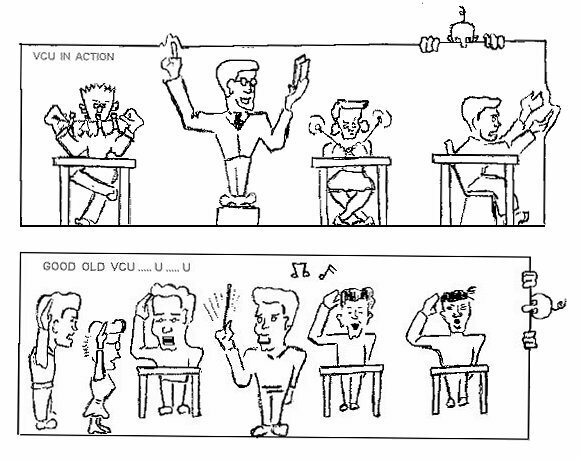 Unit 211 School Law and Administration of Education in Ontario and Unit 227 Introduction to Guidance were taken in 1961. When Unit 246 Educational Measurement and Evaluation II and Unit 271 Theory of Counselling were completed during the following summer, I was awarded a Master of Education degree on May 31, 1963. My wife, Patricia, and I were married on July 1, 1967, (Canada Day - The 100th Anniversary). [Does that mean that our first wedding anniversary will occur on July 1, 2067?] After the births of our two children, I encouraged Pat to begin her studies at York University. [As a side benefit, I did a self-directed study of Fortran from her textbooks and filled in computer cards for the university's main-frame computer. I also translated some statistics programmes from Fortran into Commodore "Basic" on our SuperPet computer for her use.] She completed her Ph.D. in Mammalogy at the University of Toronto on June 2, 1992. Patricia received a Certificate of Recognition from the Toronto Chapter of Sigma Xi (the Scientific Research Society) for serving as its president from 2002 to 2004. Both of our children, Jennifer and Rob, are successfully involved in computer-related occupations. Thus far, I have had two books published, and both may be found in the National Library of Canada. Education in Oshawa from Settlement to City, xii p 220, was published by Alger Press, Oshawa, in 1970. The references are: National Library Stacks - LA 419 C75 R68 1970 and Ontario Institute for Studies in Education, U of T - Dewey Decimal No 370.971355 R824E. 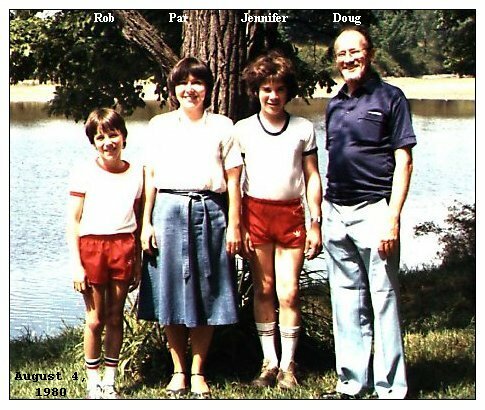 The manuscript of Our Ross Family Story, xvi p246+, was published by North York Offset, Toronto, 1978-1982. The references are: National Library Stacks - C590.R64 1978b, Canadiana Department of the North York Central Library - Dewey Decimal No 929/.2/0971 19, and Library of Congress No CS90.R618 1978. I took the liberty of updating Henry Ward's The McGregor Story in June of 2005 on my computer and doing a second printing for my children as well as the Flamborough Archives. An ongoing project has been Taddle Creek Tales, a collection of anecdotal stories from my experiences. My Enigma Machine with over 1200 rebus puzzles was completed in 2005, having been tested three times at Alastair McIntyre's Electric Scotland website during my membership at its conferences and forums. Travel has always been one of my interests. During the summer of 1958, I visited seven countries in South America (plus Trinidad). My mother enjoyed two trips (1963 and 1965) to Western Canada that were planned for her by myself. Pat and I flew to Trinidad, Tobago, Belem and Rio de Janeiro for our two-month honeymoon in 1967. Since then, we have vacationed on Manitoulin Island, travelled together to Scotland twice (1974 and 2001), taken a 33rd Anniversary cruise from Vancouver to Alaska in 2000, returned to Western Canada in 1979 as a family to visit distant cousins along the way, and flown to Beijing and Inner Mongolia during the Symposium of Asian Pacific Mammalogy in 1988 (the year after I retired as well as the year after I stopped smoking). During August of 1992, we drove East to Quebec, New Brunswick and Nova Scotia before crossing over to Maine, New Hampshire, Massachusetts, Vermont and New York on our return home via Niagara Falls. We enjoyed a drive to Lake Placid, circling Lake Ontario, in 1994, and planned a couple of flights to Florida when Pat's Mother was living there. Our daughter has treated us to trips to Colorado but, in 2004, we drove to the Four Corners (Colorado, Utah, Arizona and New Mexico), and in the Fall of 2006 we flew First Class to Australia. During this period of retirement, we have continued a full schedule of Scottish Festivals and Highland Games, Annual Ross Family Reunions and Annual General Meetings of the Clan Ross Association of Canada. Our trips, including Scotland, may be viewed at http://www.ross-ter.com/Travel/worldmap.html, where you may click on the map of the world. At one time I may have been concerned about the cost of supporting various organizations, but I'm becoming quite aware of the real cost of withholding one's support from institutions which preserve the past, present and future of our Scottish heritage. Victoria University (UofT) invited me to become a member of the Chancellor's Council in September of 1996. 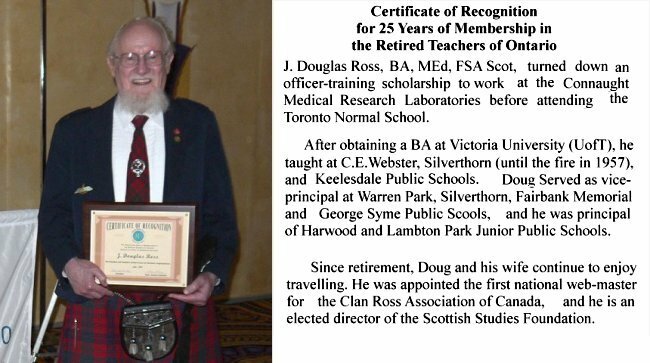 I was named the first National Webmaster of the website, Great Clan Ross.org, for the Clan Ross Association of Canada at their Annual General Meeting on July 16, 2000. At the beginning of 2005, I became a patron of the Scottish Studies Foundation; this was after having attended a Genealogy Conference at the University of Guelph (May 14-15, 1982) and a cruise on the schooner Empire Sandy (September 3, 2000), both sponsored to some degree by the Scottish Studies Society. A major relocation and overhaul of The "Ross-ter" website was started on November 20, 2005, at http://www.ross-ter.com. 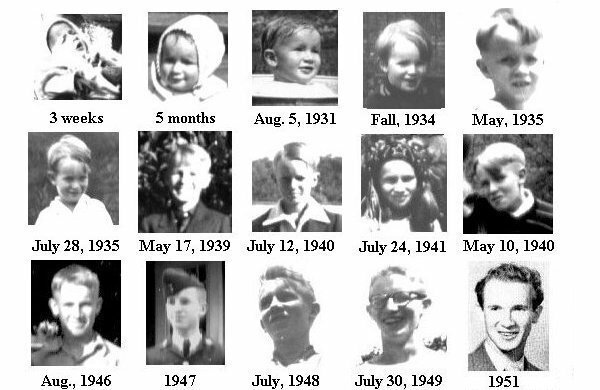 Tales of family reunions, my meeting with Grey Owl, The Earl of Ross's March, the Picts, some flying adventures, the Camp X school for spies, McCarthyism, fossils of Southern Ontario and our travels may be found there. One of my goals is to profile our Scottish-Canadian immigrants in terms of their heritage . . . those icons or symbols of Scottish culture. I have made a good start on this project in a collection of tales about our Ross settlers. 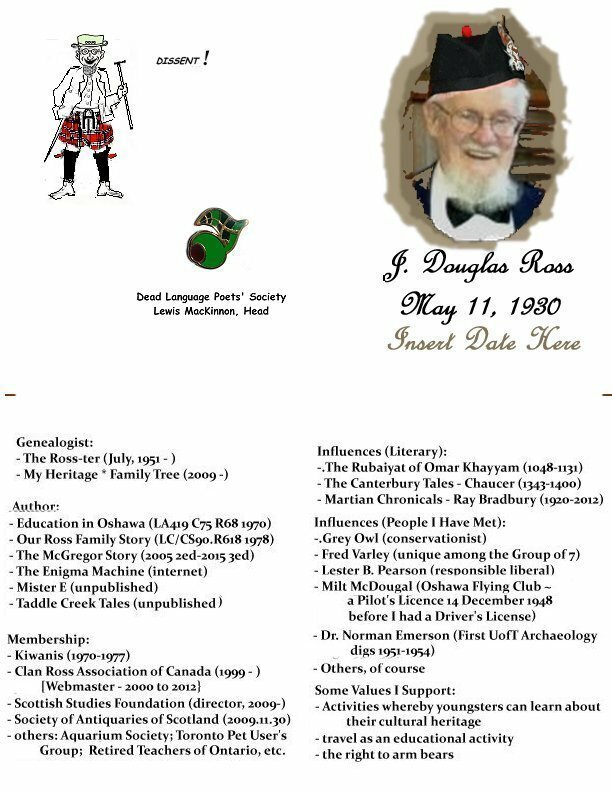 Meanwhile, the website for the Clan Ross Association of Canada, Incorporated, at http://www.GreatClanRoss.org, continues to reflect the content of the quarterly newsletters in its index. As webmaster, I have also had an opportunity to encourage family reunions and the participation of youngsters at Scottish Festivals. My other ideas have been incorporated on the final "Page of Links" in the form of 1. Links to All Things Scottish, 2. some Scottish humour, 3. a few of those aforementioned Scottish Icons, and 4. a unique Guestbook. Regretfully, the Chief of Clan Ross and I had a difference of opinion about censorship of historical material preserved by Dr. John Robert Ross. My efforts as National Webmaster became less enjoyable after a letter from Chief David, and I resigned the position on December 9, 2012. 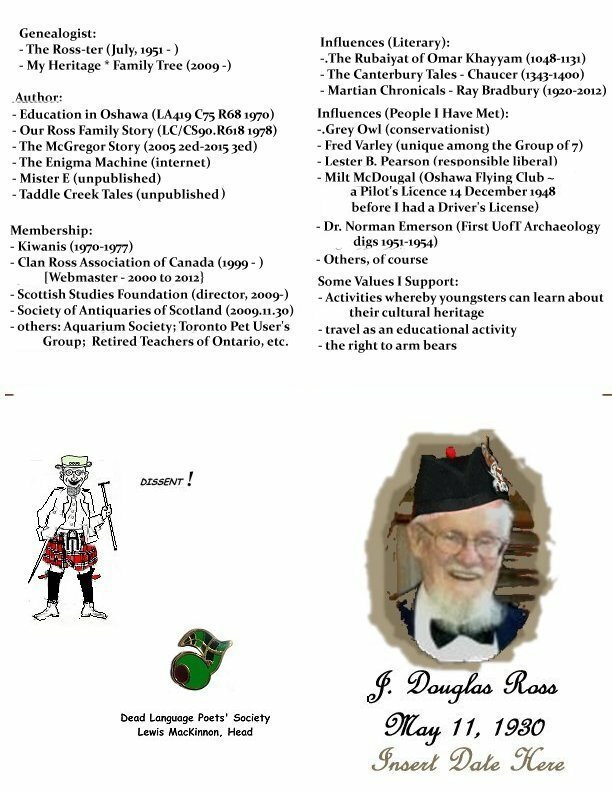 That said, I continue to support and attempt to promote the concept of a Virtual Museum of historical collections for Clan Ross Canada. My nomination was presented at a general meeting of the Society of Antiquaries of Scotland, and I was duly admitted to that Society on November 30, 2006 (St. Andrew's Day). Beginning in 2005, Patricia and I began to attend the Fergus Scottish Festivals on a regular basis. It was there that we met David Hunter and Jeanne Isley at a tent where her art was being displayed. Patricia became interested in her art work, and bought a few pieces, while David and I discussed my idea of introducing Clan Passports at Fergus. That led to my appointment on the Board of Directors for the Scottish Studies Foundation and their sponsorship of the booklets for August 14, 2010, at the Fergus Scottish Festival. The manager and president of the festival saw the benefits of the booklets and began to produce Fergus Festival Passports in 2015; rather than continue a futile competition, our efforts in 2016 have been directed towards the promotion of a Universal Clan Passport which may be used at other Scottish festivals and for any year. The space for a youngster to print his/her name has been relocated to the front cover in order to encourage ownership of their Scottish heritage and culture as well. It is a rather inexpensive method, when clan representatives produce a dozen or so booklets of their own. Instructions are found at http://www.ross-ter.com/Tales/ClanPassport/ClanPassport.html. Life may indeed begin after retirement. August 25, 2012: It was with sadness that I read that the first man to set foot on the moon, Neil Armstrong, had died. He was born in the same year that I was born, but the similarity in our lives did not end there. Both of us had a pilot's license before we had a driver's license. July 1, 2017 was our 50th Wedding Anniversary, so we had planned to celebrate it at the revolving restaurant at the CN Tower. Who knew that it would be completely booked months in advance! We could have celebrated at the Red Lobster or the Mandarin instead. At least they serve decent-sized crab legs, Sobeit! Don't go to the CN Tower 360 restaurant if you are hungry! Nevertheless Patricia and I put on our "happy faces" and celebrated our 50th Wedding anniversary on July 2. A record of the occasion was posted, and you are invited to CLICK HERE for some pictures. Coverage of our wedding on Canada Day of 1967 was started on our personal website when we celebrated our 50th Anniversary. Please CLICK HERE to visit the webpage. Thanks to David Orgel's Digital Improvements company, we were able to have two reels of our honeymoon movies transfered to a digital format, and they have been added at the bottom of the same webpage. Considering that the films were 50 years old we feel that the enhanced results using Corel VideoStudio were as good as could be expected, and brought back many fond memories of our honeymoon of almost two months.